AWCO and our shipping partners across North America provide outbound freight consolidation to maximize cost efficiency for your shipping needs. Consolidation services combine multiple Less than Truckload (LTL) shipments into a single full load to save transport costs and optimize shipping services. Consolidated outbound orders can include multiple shipments to one customer, multiple local customers or movement into an area for redistribution. 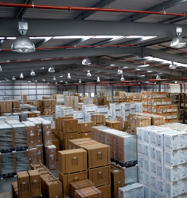 Frequent LTL shipping results in lost value and empty expenses in your supply chain. Our network of shipping experts combines LTL freight effectively and strategically to move your items through the most efficient routes. Your items reach their destinations quickly and safely with the lowest amount of travel expenses. Our partners move products between import/export harbors, storage areas, redistribution centers, manufacturing, sales and more to cut costs at any step in your logistics chain. If you would like to maximize your logistics capabilities and reduce expenses, contact us to learn more about our clients’ consolidation services. We’ll give you a list of outbound delivery rates with warehousing quotes in your area suited to your products.